Catalina Foothills Estates No. 10 Subdivision is middle of the North Area of Tucson, AZ. Shopping, restaurants, and activities are nearby. Great views of the Catalina Mountains and Tucson City lights are standard features, but be ready to pay the premium the north area commands. The north area offers buyers a wide range of home architecture and lifestyles. but at a price. The north area has the highest cost per square foot of living space in the greater Tucson area. 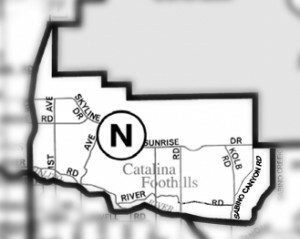 Families living in Catalina Foothills Estates No. 10 Subdivision are served by the Catalina Foothills School District – District 16 OR Tucson Unified School District – TUSD depending on the specific location. Restaurants to visit if you are living in the Catalina Foothills Estates No. 10 Subdivision or another subdivision in Tucson’s North area are Hacienda Del Sol and Flying V Bar & Grill. Are you thinking of buying a home in the Catalina Foothills Estates No. 10 Subdivision or another area of Tucson area? Finding the right home can be a challenging process. But we can make the process much less stressful for you.